An authentic Mulled wine recipe made with Ceylon Cinnamon, Apple and Pear, Orange and an inexpensive red wine. If you want the World's best Mulled authentic Wine recipe this is it. A good mulled wine is especially fabulous if it is made with Ceylon Cinnamon sticks. This is because Ceylon Cinnamon is not overtly spicy and harsh like high coumarin Cassia Cinnamon. 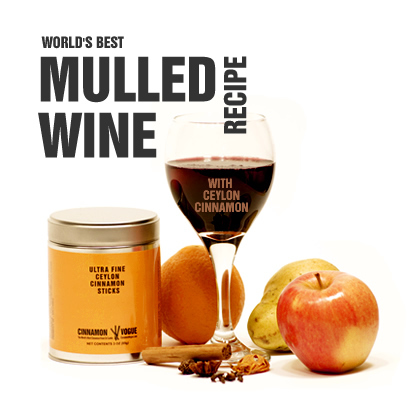 Ceylon Cinnamon creates a deeply sophisticated mulled wine with incredible taste. Combined with exotic spices like Star Anise, a dash of grated nutmeg and black Cardamom, this is without a doubt the ultimate mulled wine recipe you will find. There are many pretenders to the throne, each with it's own variation. Some make the ultimate sin of putting in brandy while others put honey and boil it, which will kill the honey. Brown sugar somehow creates a better taste, although you can use white sugar if you must. Some people go overboard with the Star Anise, a powerful spice that must be used sparingly. And some put orange juice and worse lemon juice which distorts the taste of mulled wine and gives it an insipid flavor. Our mulled wine recipe by contrast is deeply satisfying. It has just the right amount of each ingredient to create an smooth taste profile. Yes the ingredients are complex but well worth it for the rich aroma and complex flavor. Notes of citrus and clove, the sweetness of brown sugar tempered by the healing power of Ceylon Cinnamon and the hypnotic effects of Star Anise. The perfect Christmas drink to warm the heart, the body and the soul and to get rid of bad bacteria and reduce the ill effects of over indulgence. Let it heat up slowly over 45 minutes until it comes to a boil and immediately remove from stove top. Unlike ordinary Cassia Cinnamon you find in the stores, Ceylon Cinnamon has low Coumarin levels, so it won't damage your liver, especially if you are a regular Cinnamon tea drinker. Besides Ceylon Cinnamon is mild, yet slightly sweeter. It is not spicy like store bought Cassia Cinnamon, but has hints of cloves and citrus with wonderful subtle aroma. Ceylon Cinnamon is subtle and adds to create a more complex flavors. You would never know there is Ceylon Cinnamon in this dish, unlike Cassia Cinnamon which tends to be harsh and immediately makes its presence felt and often ruins the recipe.